Deconstruct. I find the action behind that word quite frightening. It’s hard. Construct. Construct is better. Building is much easier. There’s a start and an end goal. But evaluating, breaking things into pieces, and adapting as a result—well that’s just so much more difficult. Important but arduous. I vividly remember my least favorite task in elementary school—second and third grade to be exact. Storyboards. Instead of writing a report, analyzing at the beat of our own young-minded understanding, we had to break up a story into parts. Concrete parts. I am now an ardent maker and follower of rules. But to me then, nothing was concrete. We were required to fit a story into distinct categories and subcategories, from “exposition” to “climax” to “dénouement.” The “scenes” that represented these categories were drawn carefully in Crayola colored pencil within clear lines and boxes. Rigid. One scene could not mean or be or act as two things. We had to identify a protagonist and antagonist. Well, that just wasn’t me. I wanted the protagonist to be the character who was compelling to me. And this character was often not the technical protagonist. And in third grade, what if I desperately wanted the story to be my story and what if when character X walks to Y wearing Z, it was me who I envisioned in her place? I’ve changed. I am more practical. I do see aspects of life in concrete terms now. But deconstruction can still be a struggle. I’ve been going through some much-needed personal deconstruction, which is reminding me everyday how truly hard it is. I think too much. I think too much it hurts. And I’m trying to organize those thoughts into categories to identify what’s wrong and what’s different. Everyday on my way to work, I‘ve been thinking about what’s missing. I usually walk (what a luxury! ), so that comes along with all of those stereotypical “cause for thinking” sounds and visuals. All I know is that there’s something missing. The thinking gets me nowhere. I can’t figure out what it is. It’s at the tip of my tongue, but we all know that the distance between that rosy tip and the reality of truly knowing is grand. It’s not work: My job is stimulating. It’s not life: My days are always filled. Greedy, then? Maybe. I’m answerless still. But then there’s food. Food is easy to deconstruct. Classic dishes are broken into pieces and lined up on a plate. I’m not sure how I feel about the concept. I don’t hate it. But in trying to be original, the chef sometimes ends up being no more creative than the makers of those composed dishes, no? But I did just that in this recipe. 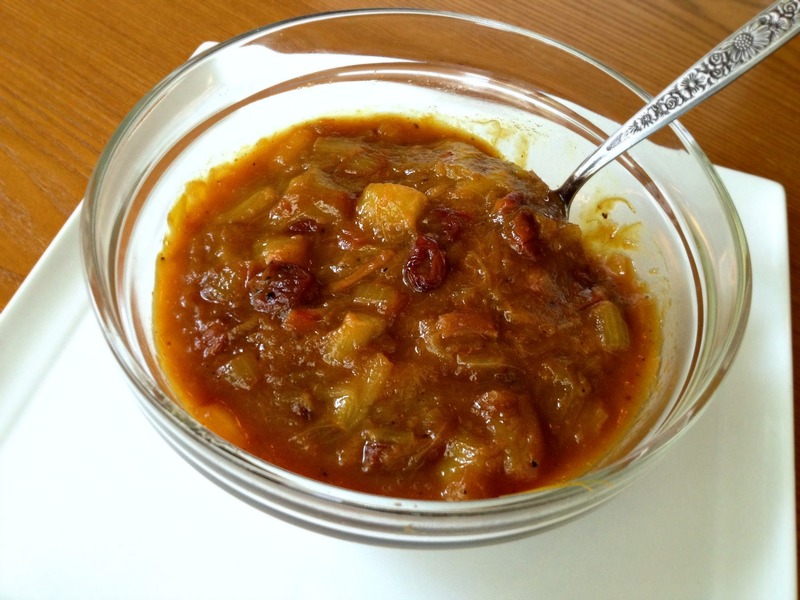 I deconstructed an Iranian classic: Khoresh Rivas or Rhubarb Stew. Lamb with rhubarb stew, actually. I did it for three reasons: First and foremost, the one thing I know I am not missing from my life but which I always say is missing from the American diet is bitterness. Bitter—I’ve been an awful lot of that lately (for good reason I like to think). The stew is pleasantly bitter, with its sharp rhubarb, acidic lemon, and grassy herbs. I like the exciting role that bitterness and acidity play in Asian cuisine. Americans just don’t have anything of the sort. Maybe some greens that we cook with are a bit bitter. But I could use a certain kind of punch now and then. And that’s why I love rhubarb so. And we only have so much time left with it! Second, I have no desire to cook or eat stew right now. And third, that stuff, like most Persian stews to be honest, is F-ing ugly. Chunks of lamb swimming in a loose, greenish base, with rhubarb pieces bobbing about. Ok, not ugly to me. I find beauty in the “ugly.” But I can’t say I’d entice you with it. So I took the flavors of the stew and integrated them into the three components of my deconstructed dish: lamb meatballs, rhubarb chutney, and celery salad. It’s nothing at all for those of you who don’t like bitterness to be afraid of, but it’s bursting with the flavors of beautiful herbs and spices. 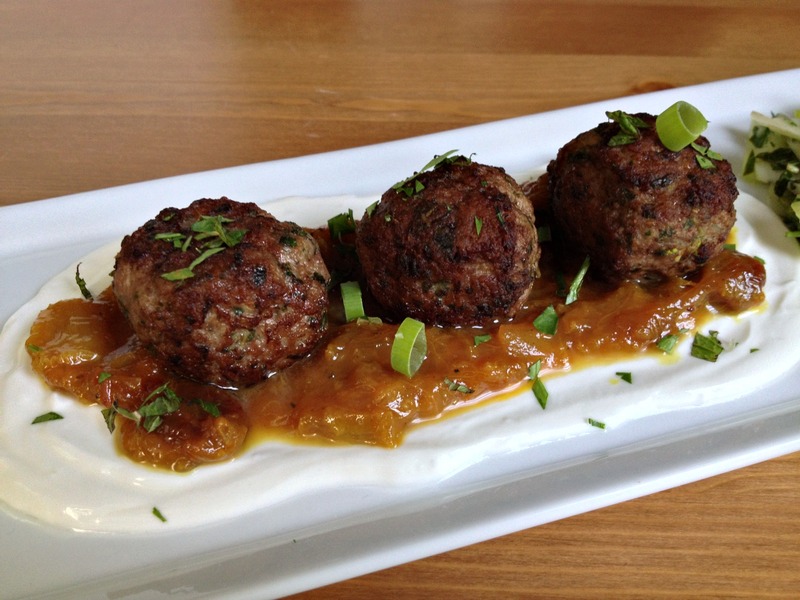 Lamb chunks are reinterpreted as meatballs. 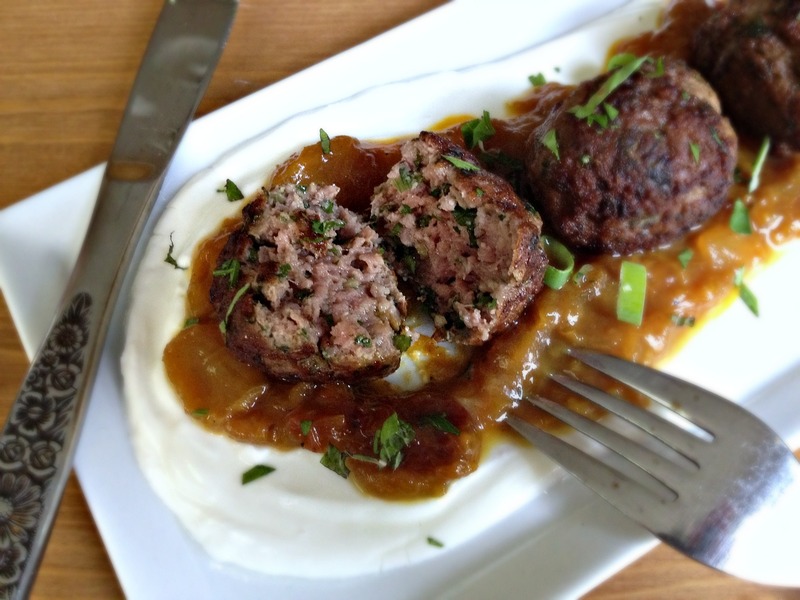 The meatballs, made from ground lamb shoulder, have a nice crust and are exceedingly moist, tender, and rosy at the center and bursting with meaty juices. They’re flavored with the stew’s parsley, mint, and ground coriander plus scallions. To make the meat shine, they’re bound only by some ground nuts (a common trick in the Middle East) and an egg, and they’re enhanced with some good full-fat yogurt. They sit atop a rhubarb chutney that’s simultaneously sweet, pungent, and sour, perfumed by the stew’s usual additions of turmeric, saffron, and cinnamon. It’s actually pretty “ugly,” too. Most chutneys are. But it’s hidden below meatballs. A simple side of a lemony, herb-y celery salad is a crisp and cooling addition, which takes the celery that usually serves as an aromatic vegetable in the stew and gives it life and crunch. Something, right now, might be missing. Life may be incomplete. But sitting down to this meal made things seem whole, as if that puzzle piece was temporarily in place. I was able to deconstruct something, dammit! Until my saffron high faded, night fell, and I started to think again. I made the chutney two ways. The pictured way is written in the recipe below, as I didn’t want chunks to serve as a bed for the meatballs. If I were to use this as a stand alone recipe—it’s so, so good—as a topper or side for a cut of meat, I would cook the rhubarb only for the 5 minutes, stirring in the cherries in the last 2 minutes to keep them more whole. I have been eating the leftovers over Greek yogurt for my breakfast/mid-morning snack. I’m infatuated. For a very sharp, pungent chutney add the higher yield of vinegar; for a sweeter but still punchy chutney, use the smaller yield. As for the meatballs, please do grind the lamb shoulder yourself or have a butcher grind lamb shoulder fresh for you. I do not trust prepackaged ground lamb and I cannot ensure that the results will be as juicy or as flavorful, as the fat content could be lower. If you want your meatballs cooked through more than medium, bake them until they reach your desired doneness, though I think they’re succulent at medium. 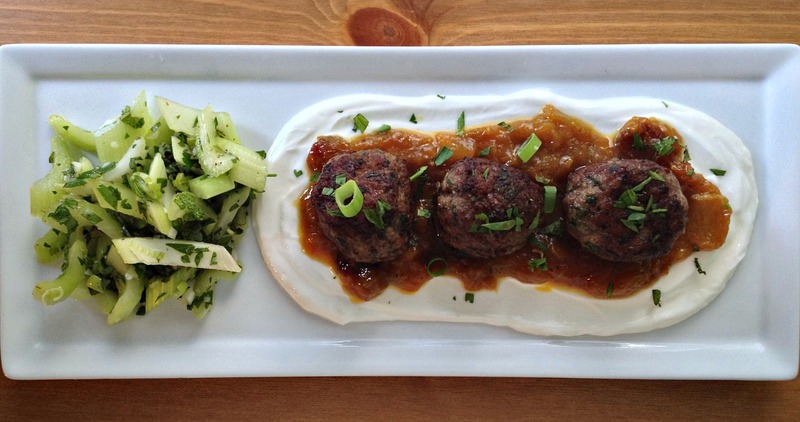 This can be served as a meal or a mezze dish. Heat oil in large saucepan over medium heat until shimmering. Add onion, pepper, salt, and turmeric and cook, stirring occasionally, until onion has softened, 5 to 7 minutes. Add vinegar, sugar, cinnamon sticks, and saffron and bring to boil over medium-high heat. Add rhubarb, reduce heat to medium-low, and simmer, stirring occasionally, until rhubarb is tender, about 5 minutes. Stir in cherries and cook until rhubarb begins to break down and mixture is thickened, 3 to 5 minutes. 1. Adjust oven rack to middle position and heat oven to 300 degrees. Line baking sheet with aluminum foil and set aside. Heat 1 teaspoon oil in small skillet over medium heat until shimmering. Add scallions and cook, stirring occasionally, until softened, 3 to 5 minutes. Place scallions, walnuts, parsley, mint, salt, pepper, and coriander in large bowl. Add yogurt and egg and whisk to combine. Add ground lamb and mix with hands to fully incorporate (but don’t overmix). 2. 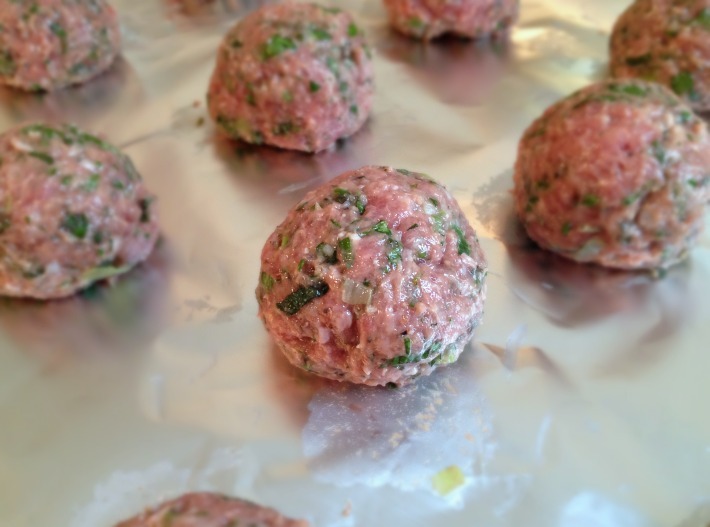 Using 3 tablespoons meat mixture at a time, roll into balls and place on prepared sheet. (The mixture may seem wet or sticky but it will form neat balls. 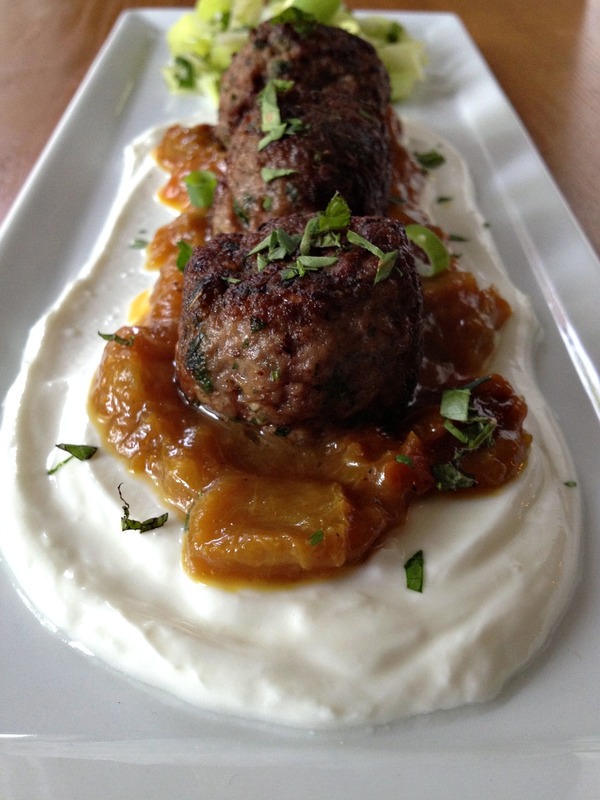 Don’t worry about the stickiness; it will result in exceedingly juicy meatballs.) Transfer sheet to refrigerate and chill for at least 20 minutes or up to 40 minutes. 3. Set wire rack in second baking sheet. Heat 1 tablespoon oil in 12-inch skillet over medium-high heat until just smoking. Add half of meatballs and brown well on all sides, 4 to 5 minutes. 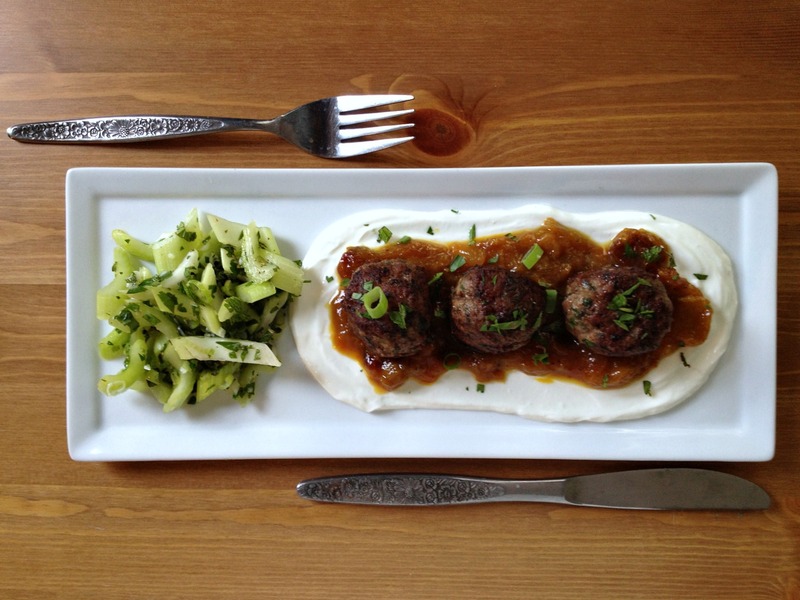 Transfer meatballs to paper towel–lined plate, wipe out skillet to prevent browned bits from burning, and repeat with remaining 1 tablespoon oil and meatballs. Transfer browned meatballs to wire rack and place baking sheet in oven. Bake until meatballs register 140 degrees (for medium), 8 to 10 minutes. No recipe required: Toss celery; a whole bunch of herbs and scallions; lots of lemon juice; and extra-virgin olive oil together. Season with salt and pepper to taste. going through the process of breaking down, evaluating, and improving is definitely hard work… but worth it? i hope! i have been doing some of that lately as well. this looks absolutely phenomenal, and i’m so glad to have some rhubarb in the fridge already! Yes, definitely worth it :). I froze a bunch of rhubarb since it is fading, and I’m trying to force myself not to just make this again! Yes! They are worth it!!! My husband thought they were amazing. He couldn’t stop talking about them!! I loved them too. Didn’t make the chutney with them but will try it next time.